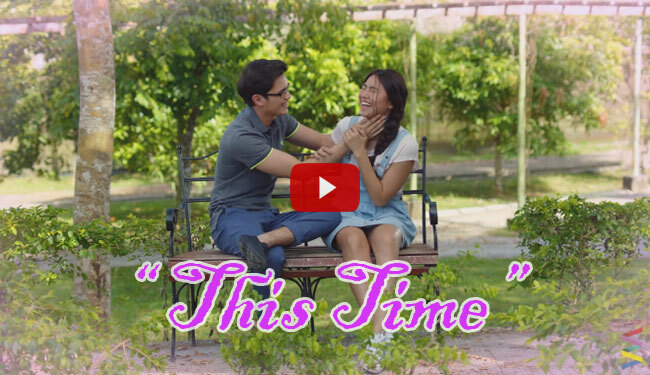 As one of the hottest love team in our country, fans of James Reid and Nadine Lustre will finally see their idols again on the big screen entitled “This Time”. Viva Films first released its official movie poster last March 26 and now its official teaser last March 28. On the trailer, Nadine and James play as Ava and Coby that were childhood friends who were only seeing each other during summer vacation. When they grew up, Ava express her concerns with her friends if his relationship with Coby needs a label. Coby then approach Ava to ask her if she has feelings for him but she express the conflicts of being on a long distance relationship. At the end of the clip, Coby is holding Ava’s face and is seen making faces that make Ava burst out of laughter. The movie is directed by Nuel Naval and soon will be shown in movie theaters on May 4, 2016.It also stars Bret Jackson, Yam Concepcion, Donnalyn Bartolome, Candy Pangilinan, Issa Pressman, Al Tantay, Freddie Webb, John Lapus and Nova Villa. This will be the 4th movie that will be topbilled by James and Nadine following Diary ng Panget , Talk Back and You’re Dead in 2014 and Para Sa Hopeless Romantic in 2015. They also previously finish their hit tv series “ On the Wings of Love” who got high ratings on its finale. Recently, the on and off screen couple is on Europe for their Jadine In Love World Tour. They will also celebrate their 2nd monthsary this coming April 11 when they became a couple Last February 11. James proclaimed her love for Nadine with their thousands of squealing fans in Araneta Coliseum last February 21 and now they are glad that they don’t need to hide their relationship anymore.